My cousin recently told me she had discovered that one of her ancestors had bequeathed several slaves in his will. She has allowed me to recover their names and list them here, and I am adding them to the Slave Name Roll Project. I hope that sharing these names may help someone find an ancestor. "I Benjamin Wood of the County of Harrison and State of Virginia do hereby make my last will and Testament . . .
Gabriel and their future increase forever . . .
and out of the proceeds of the sale that my Executor pay to the surviving children of my Daughter Elizabeth Robinson Deceased six hundred dollars . . .
"in witness thereof I have hereunto set my hand and affixed my seal this 5th day of January in the year of our Lord 1839"
I was stunned when I discovered I had not written about new links on the Wikipedia newspaper archives page since last December. It has been on my list of things to do, but somehow it kept slipping further down the list. I'm glad I have caught up for a while, at least a little. This batch has some locations with little available online, such as Kenya and Puerto Rico, plus I personally found the Belvidere newspaper obituary index very useful for my own family research. If you're researching in Iowa, there are six new archives listed. And all of these new links are free, just like last time! • British Columbia, Canada: The Bill Silver Digital Newspaper Archive on the Vanderhoof Public Library site has three digitized area newspapers. • Ontario, Canada: Digital Kingston has a site with newspapers going back to the early 19th century. It overlaps with Kingston papers in the OurOntario.ca Community Newspapers Collection but has some earlier and some additional newspapers available. • Ontario, Canada: Thunder Bay Public Library has several downloadable PDF index files available on its site for birth/marriage/death notices, obituaries, social news, and even some World War I references for 1914. • India: The University of Heidelberg has digitized copies of most of the 1781 issues of Hicky's Bengal Gazette, or the Original Calcutta General Advertiser. • Israel: Five newspapers have been added to the online holdings of the National Library of Israel, three published in Israel and two in New York. • Kenya: Virginia Tech hosts a digital archive of the Kenya Gazette. Currently the collection runs from 1972–1989; plans are to digitize all issues of the Gazette, going back to the 1890's. • Puerto Rico: The Gazeta de Puerto-Rico has been added to the Chronicling America collection. The date range is 1837–1893, but there are gaps. • Arkansas: Index to Benton Courier (Saline County) obituaries from 1930–present, downloadable as PDF files. • California: The San Mateo County Genealogical Society has downloadable PDF files with indices of newspaper birth/marriage/death notices and of obituaries (along with indices to various county records). • Illinois: The Evanston Public Library has a searchable index for the Evanston Review that currently covers 1925, 1966–1972, and 1999–2004. • Iowa: The Appanoose County Historical Society has an online archive of Centerville newspapers. • Iowa: The Monroe County Historical Society has an archive of newspapers for Albia and other locations in the county. • Iowa: The Museum of Danish America has digitized some Danish-American newspapers and a scrapbook. • Iowa: Sioux County has a second historical newspaper archive site, this one through Advantage Preservation. The coverage is not the same as that through Newspaper Archive. • Iowa: Taylor County has an online collection of digitized historical newspapers ranging from 1859–2009. • Iowa and Missouri: O'Dell's Abstracted Newspaper Index covers southwest Iowa and northwest Missouri for 1859–2014. • Minnesota: The Great River Regional Library has an obituary index for the St. Cloud Times that covers 1928–2013, which is helpful, because the Times itself is available only for recent years via a ProQuest subscription database. 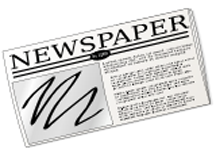 • New Jersey: An index of obituaries and other death announcements has been created for the Belvidere Apollo/Intelligencer/Apollo Journal (as with many newspapers, the name changed over the years), downloadable as PDF files. So far the index runs from 1826–1914, and the volunteer creating it plans to finish the entire run of the paper, through 1953. I am thrilled this index is available online, because my 3rd-great-grandfather Franklin P. Sellers published the newspaper under the Intelligencer name. The index includes obituary listings for him, my 3rd-great-grandmother Rachel G. Sellers, my 2nd-great-grandfather Cornelius G. Sellers, and a few more relatives. (Though I unfortunately did not find a listing for Cornelius' step-brother, William/John Mathews.) I will soon be sending a request for photocopies to the Warren County Library! • New York: The Troy Irish Genealogical Society has created an index of death notices appearing in Lansingburgh newspapers from 1787–1895. It also has an index of death notices collected by the Burden Iron Company in Troy. • Ohio: Obituary indices for the Akron Beacon Journal from 1841–2012, downloadable as PDF files. • Ohio: The Barberton Public Library has indices to obituaries in four local newspapers, covering 1892–1960. They are downloadable as PDF files. • Ohio: The Huron County library has online birth announcement and obituary indices for the Willard area. I can't find a way to tell what years they cover. 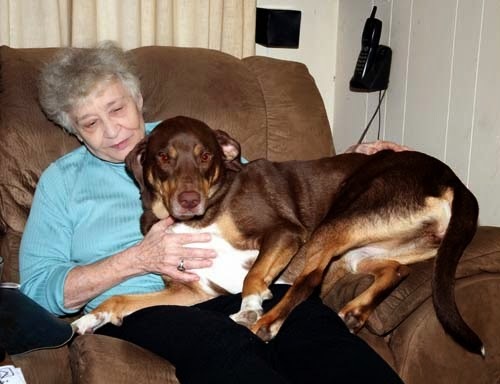 • Oklahoma: The Muskogee County Genealogical Society has an index to all deaths that were found in Muskogee newspapers, not just from obituaries and death notices. • Pennsylvania: Pennsylvania State University is hosting a 1937–2014 obituary index for the Centre Daily Times. Many years also have images. • Pennsylvania: The Lititz Public Library has a downloadable PDF file with an obituary index for 1877–1998 for two local newspapers. • Rhode Island: The Cowl, the student newspaper of Providence College, has been digitized from its beginning in 1935 through 1980, except for 1944–1945 (which I suspect will be added soon). • Washington: The Bainbridge Review 1941–1946 has been digitized and made freely available on the Kitsap Regional Library Web site. The newspaper is significant because its publishers consistently published editorials railing against the internment of Japanese-Americans during World War II. The project is also special because volunteers transcribed the articles instead of relying on OCR. • United States National: Transport Topics, the national newspaper for the trucking industry (I had no idea there was such a thing), has begun to post archival content free on its site to celebrate its 80th anniversary. In other newspaper news, there was another sighting of a rare newspaper on Antiques Roadshow. In Charleston, West Virginia, a woman came in with issues of the 1945 Oak Ridge Journal bound in two books. Oak Ridge, Tennessee was the town created to house people working on the Manhattan Project. The woman's mother was the editor of the newspaper. Looking at the paper's listing on Chronicling America, it seems that mostly a few scattered copies are known to exist, and certainly not the entire year for 1945. As I said when a four-year run of the Confederate newspaper The Family Friend was appraised last year, how do we find this woman and convince her that these papers should be digitized and shared with others? At least in this situation I think it's less likely she'll be tempted to turn around and sell them. Unfortunately, I've had a negative experience recently with online newspaper listings. I read a blog post where someone copied an entire section from the Wikipedia newspaper page, literally word for word — even including the internal Wikipedia links — and wrote about it as though it were their own work. So many people believe that because something is on the Internet, they can just copy it and not credit where it came from. 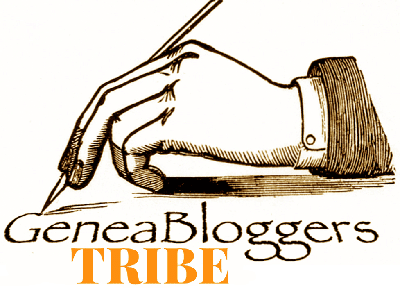 Conveniently for the "author", the blog is not set up to accept comments. Well, if nothing else, I consider this type of behavior a great way to learn who I would not want to work with or trust for research. This week for Saturday Night Genealogy Fun, Randy Seaver told everyone about a fun site that lets you customize maps of the U.S. and Canada based on how many times you have visited states and provinces. 4) Tell us, or show us, your "Where I've been" map and any other map that you created having fun tonight. Put them in your own blog post, on Facebook or Google+, and leave a comment on this blog post so that we all see them. I have lived in California, Florida, and Nevada. I have visited all the other green states multiple times. The red states are generally places I either drove straight through or landed in an airport for a layover. For New Hampshire and South Carolina, however, I deliberately went over the state border (from Vermont and Georgia, respectively) specifically so I could say I had been in the state. Both times I did a little dance (not the genealogy happy dance, though!). * red for states/provinces where I had only one ancestor. 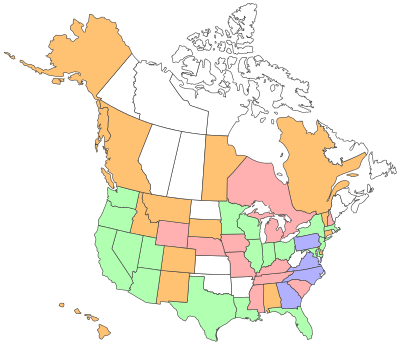 * amber for states/provinces where I had 2–3 ancestors. * blue for states/provinces where I had 4–6 ancestors. 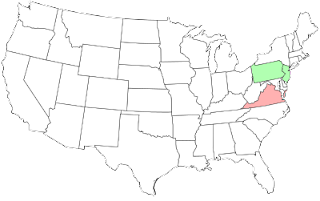 * green for states/provinces where I had more than 6 ancestors. It turns out that I didn't need to be that detailed. In 1865 all of my ancestors save one were in New Jersey or Pennsylvania. The one ancestor who wasn't, my great-great-grandfather Cornelius Godshalk Sellers, was somewhere near Washington, D.C., which doesn't even appear on the map! I put a marker for him in Virginia, guessing that was probably the side of DC he was on. If I did a map of where my U.S. great-great-grandparents or 3rd-great-grandparents were married, or where they were born, it would probably look pretty similar to this one, with almost everyone (if not everyone) in New Jersey and Pennsylvania. If I added births of more recent ancestors, I would at least be able to include a few in New York. I did notice on the description page of the map site that the Canada map was added to the original U.S. map because someone else created it. Maybe someone will create a Europe map?? It is amazing how easy it is to fall behind on things! But I have finally rewatched the final episode of this season of Who Do You Think You Are? enough times that I think I caught all the information I wanted to, and made enough time in my schedule to write about it. WDYTYA closed out the season with Melissa Etheridge. The opening voice-over tells us that she will dig into her French roots and learn about a family shaken by scandal, a turbulent relationship touched by tragedy, and a young adventurer who prospered in Colonial America. Etheridge herself is a Grammy-winning, multiple-platinum singer with a celebrated career. Her best known songs are "Come to My Window" and "I'm the Only One." Her twelfth album, recently released, is This Is M.E., and she won an Academy Award for Best Original Song in 2007 for "I Need to Wake Up" from An Inconvenient Truth. She lives in Los Angeles with her wife, Linda Wallem, and four children from her previous relationships. Etheridge tells us that she was born in Leavenworth, Kansas, in 1961; her parents are Elizabeth Williamson and John Dewey Etheridge. She was very close to her father, who died at the age of 60, when Etheridge was 30 years old. He grew up in a small town outside of St. Louis, Missouri, in a family of migrant farmers. From nothing he created something, improving his lot in life to where he had a two-car garage and a house, living the American dream. The price of achieving that dream was that the family didn't talk about what was required to get there. Etheridge's mother did some family history research at some point in the past on her father's side of the family and had learned that his mother's line came from Québec. Etheridge's first large concert was at a convention center in Québec, so she thinks it might be something in her blood (I hope she wasn't serious). Because she and her father were so close, she wants to learn more about that part of his family and maybe bring a little bit of him back to share with her children. Apparently basing her search on her mother's research (I hope she did a good job! ), Etheridge begins her journey in Québec City. She meets historian Jennifer J. Davis (of the University of Oklahoma), whom she has asked to look for anything connected to her French-Canadian ancestors (not asking for much, is she?) at the Québec National Archives. She has brought with her a family tree printout from her mother's research 15 years ago; it looks like it came from a very old version of Family Tree Maker, so it's impressive that Mom has kept it all these years. We see only parts of the tree, and only the direct line of Janis ancestors is discussed. First is her paternal grandmother, Golda Martha Janis, born February 8, 1901 in Wayne County, Missouri, died April 1982 in St. Louis, Missouri. Golda's father was James Felix Janis, born 1868 in St. Francis County, Missouri, died 1957 in Missouri. His father was Jewell R. Janis, born 1844 in Missouri, who married Martha, born 1849 in Missouri. Jewell's father was Pierre Antoine Janis, born October 27, 1809, died July 29, 1883. Pierre's father was Jean Baptiste Janis, born 1759 in Randolph County, Illinois, died 1836 in St. Genevieve, Missouri; he married Marie Reine Barbeau, born 1781 in Randolph County, Illinois. Jean's father was Nicholas Janis, born January 7, 1720 in Québec, Canada; he married Marie Louise LaSource. Lastly, Nicholas' father — Etheridge's 6th-great-grandfather — was François Janis, born 1676 in France; he married Simone Brussant. (A couple of other names on the tree appeared on screen. Above Jewell's name was Sarah Loving, born 1787 in North Carolina, died October 21, 1871 in Jefferson County, Illinois. Above Jean Baptiste was Polly Stroop, born 1757, died in St. Clair, Alabama.) This was similar to Bill Paxton, in that the celebrity already had a good deal of information about the family history. Etheridge deduces that since Nicholas was born in 1720 in Québec, François was probably there also, and therefore it's a good place to start her research. Davis says they should start with the census, which has pretty good data. She takes out a book for the 1716 census of Québec (Recensement de la ville de Québec pour 1716, available freely online, so Etheridge could have looked this up at home). In the index, Etheridge finds Janis on what she says is page 401, but is actually family #401. On finding the family in the book, she begins to butcher the French (for which she apologizes, but which unfortunately continues throughout the episode). François was an aubergiste, which Davis explains was an innkeeper. His wife was Simonne Brousseau (mispronounced horribly), which Etheridge realizes is her 6th-great-grandmother. They had children named Charlotte, Antoine, Thérèse, Jacques, François, and Marie Aimé. Etheridge comments that Nicholas wasn't there but realizes it's because he wasn't born until 1720. The fact that the family had a servant is not mentioned. The case, dated October 19, 1724 (which date I could not find anywhere on the pages online), states that Debreuil, the son of the royal notary, a government position, courted Charlotte under the pretext of marrying her. Charlotte was about 15–16 years old. The suit was essentially asking for Debreuil to marry Charlotte or pay up. (Not brought up is that the actual documents state that François was the chef de cuisine for the general, which doesn't sound like a slouch position.) Etheridge and Davis discuss the fact that Charlotte's parents (actually only her father) are speaking for her and there's no way of knowing what she herself wants. She is the center of the case but is the only one who doesn't speak. The narrator pops in with a comment that in 18th-century France, women were the property of their fathers until marriage. Losing one's virginity could put the family's reputation at risk. In the court documents, Debreuil called Charlotte a streetwalker, which means he made that statement in court before the bishop. Davis says this could have affected the reputation of François' inn, which he wouldn't want to have the reputation of a brothel. (But since the documents say he was the chef de cuisine of the general, was he even still an innkeeper?) The end result was that Debreuil was fined 20 livres, about what a skilled artisan might earn in a week, payable to the poor of the Hôtel Dieu. The fine was going to the hospital or to poor relief, not to the family. Debreuil was held responsible only for not following through on the promise of marriage. So the settlement provided no income or marriage to poor pregnant Charlotte. Because François was a witness, Etheridge wonders if her family was supportive or if they were simply telling her what to do. At that point, she actually brought more to the marriage than Debreuil did, so there might even have been some love between the two of them. But what about the child that started all this? Davis tells Etheridge she should look at the parish registry records at Notre Dame Basilica and offers to meet her there the next morning. In the interlude Etheridge talks about how moved she is that Charlotte's father defended her in court. She is certain that her own father would have done the same for her. (The father-daughter dynamic explains why the show spent so much time researching a collateral line, which is unusual for them.) She wonders whether Charlotte was really in love and what happened to the child — did it survive? Was the child the only reason for the marriage? What was Charlotte's relationship with Debreuil? The next day, as promised, Etheridge meets Davis at Notre Dame Basilica in some sort of side room. On a table is a book. Davis tells Etheridge that the priest has asked them to wear gloves (the infamous conservator gloves) because the documents are delicate. The book is a chronological list of baptisms in the parish. On April 29, 1725, Anne Françoise, daughter of Jean Debreuil and Charlotte Janis, was baptized. So when the ecclesiastical suit was started, Charlotte was about three months pregnant. The next record Davis goes to is the burial of little Anne Françoise on May 6, 1725, saying she was buried eight days after she was born (so the baptism must have been the day after her birth). (I found Anne Françoise's baptismal record on Ancestry but not the burial. It should be in the Drouin Collection; maybe it's because Ancestry's index is that pathetic?) The surprise here is that the marriage was a year and a half later, so the pregnancy couldn't have been the reason. Maybe Debreuil actually did love Charlotte! Maybe his family had prevented the marriage the first time. After discussing Charlotte's death, the subject suddenly reverts back to Etheridge's ancestor, Nicholas, who was about 13 years old when his sister died. Davis said she could not find anything in the parish records for Nicholas as an adult (although showing the baptism of her ancestor apparently wasn't important, that record I managed to find on Ancestry), which indicated he had probably left Québec by that point. Etheridge brings out the family tree her mother had created, which shows that Nicholas' son, Jean Baptiste Janis, was born in 1759 in Randolph County, Illinois. Davis says that Randolph County will almost certainly have more records on Nicholas, because Kaskaskia (which is a city in the county, but she doesn't say that) was a social hub and economic trading center. It sounded like a huge leap to me, but of course I hadn't read the script. As she leaves the basilica, Etheridge talks about how she believes in love and how despite existing customs and mores love conquers all (obviously reflecting on her own life). Now she will follow the trail of her 5th-great-grandfather. 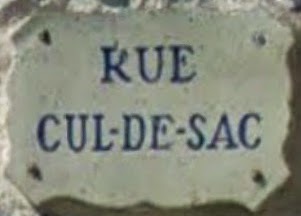 Before she leaves Canada, however, she goes to the rue du Cul-de-sac and realizes that when she visited Québec with her father many years previously, the two of them had walked down that street together, without knowing that their family had lived there. I find it pretty amazing that she was able to remember going down the street, but maybe I'm being cynical. And the next stop on Etheridge's research tour is indeed Randolph County, Illinois, specifically Chester. She heads to the county archive-museum, housed in the courthouse addition built in 1864, to meet historian Alexandre Dubé (a specialist in early French North America from Washington University in St. Louis). And of course, she has asked him to look for any documents he can find on Nicholas. In the museum, they look in an old-fashioned card catalog (I miss them!). Not only are there several Janises, Nicholas has three cards with lots of references. The name also appears as Janisse (which would give the same pronunciation in English as the name has in French with the original spelling). Before following up on any of the references from the card catalog, Dubé shows Etheridge a 1740's map indicating that Kaskaskia was a large territory in the Midwest. (I could find no online reference for Kaskaskia other than for the city in Illinois, not even in the David Rumsey map collection; the closest thing I found to the territory shown on the map was Illinois Country.) Québec is at the top of the map. They trace Nicholas' journey to the Randolph County area, following the Great Lakes and then down the Ohio River. The narrator explains that in the first half of the 18th century Kaskaskia was a strategic trading hub in New France, which spanned territory from Hudson Bay all the way south to the Gulf of Mexico. Then we finally get to a document, for which Dubé fortuitously has a translation ready. Dated September 26, 1747, it relates to a business partnership between Nicholas and a man named André Roy and was witnessed by a notary. Roy apparently was ill, and the document was "just in case" something happened to him. (See the end of this post for the text of the translation.) As Dubé and Etheridge are talking through the translation, Etheridge asks what the word "voyageur" means, and Dubé explains that while literally it translates to "traveler", in this context is means a long-distance trader. (So why didn't they actually translate the word in the translation? Just to give Dubé a chance to explain?) They were working in the fur trade. As a voyageur, Nicholas had some experience and skills under his belt. He would have known what types of items could be traded with the Indians, who supplied the fur pelts. From the items listed in the contract, Nicholas and Roy appeared to have had some sort of store. Many things listed were quality trade items, and they seemed to have been pretty successful. Etheridge reads "idem" as "item" for "one idem old with diamonds", and Dubé does not correct her; it most likely meant the same type of item as had previously just been mentioned, so it was a pair of diamond buckles, not just a generic old "item" with diamonds. Nicholas was doing very well at 27 years old. To learn more about him and his family, Dubé recommends that Etheridge look at parish records from Immaculate Conception, the parish for Kaskaskia. As she leaves Chester to head to the next stop on her discovery tour, Etheridge talks about how much she loves the adventure she is having. She knows more now about what Nicholas was doing in the area, and he had a great business. But did he have any family? Etheridge's father grew up near this area, and learning about her family is breathing life into the history she has here. After talking about it so much, Etheridge is now finally in Kaskaskia itself, at the Church of the Immaculate Conception. John Reda, a historian of Colonial America, is there to greet her. They are going to see if parish records shed any light on the family life of Nicholas. Reda shows her an entry, but of course she "can't read the fancy French", so another translation is nearby. On April 27, 1751, Nicolas Jannice (Etheridge does notice the different spelling), son of the late François Jannice and Simone Brussant, married Marie-Louise Taumur, the daughter of Mr. Jean-Baptiste Taumur dit LaSource, a former officer with the militia, and Marie Françoise Rivart. (We saw Marie-Louise's name on the family tree created by Etheridge's mother, with the maiden name LaSource. "Dit" names among French-Canadians are a fascinating subject.) Somehow, the discussion segues from the marriage to how things would be crazy soon due to the British and the upcoming war. The narrator explains that in 1754 the Seven Years' War would begin, pitting the British against the French in a fight to control the land in North America (in the United States the conflict is commonly called the French and Indian War). After their defeat in 1763 (yes, I know that makes it 9 years, but the 100 Years' War actually lasted 116 years, so these things aren't very precise), the French lost all their land east of the Mississippi River. Reda points out that after 1763, the Mississippi River became an international boundary, separating Spanish territory to the west and British to the east. Because he was on the east side of the river, Nicholas was now a British subject. He owned a substantial amount of property, but this was a volatile period. To learn what might have happened to Nicholas during the American Revolution, Reda says he thought of George Rogers Clark, the general who led British forces into Kaskaskia in 1778, and the diary of John Todd, the civil commandant of the area after Clark captured it. 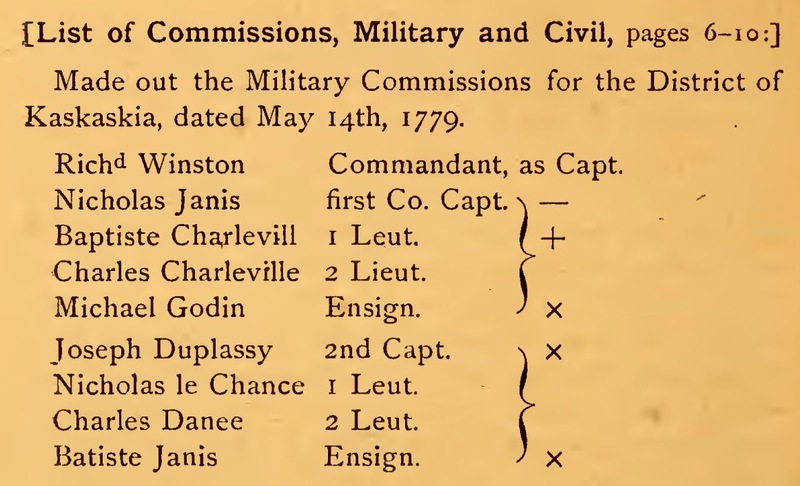 Todd's diary shows that on May 14, 1779, Nicholas was made the captain of the 1st Company for the District of Kaskaskia (not mentioned is that "Batiste" Janis, probably Jean-Baptiste Janis, Etheridge's 4th-great-grandfather, was made an ensign on the same day). Nicholas was not a young man — Etheridge says he was about 59 years old (another celebrity who likes to track ages) — and Reda agrees, saying that he was not going to fight but would serve as a liaison and an administrator. He became one of the leading figures collaborating with the Americans. This was not easy, though, because they were fighting a war for the survival of their new country. The narrator jumps ahead to the end of the war, pointing out that residents of the Mississippi Valley were British subjects until the end of the Revolutionary War in 1783, when they became citizens of the United States by virtue of the fact that the Americans won. Reda picks it up from there, saying that with the war over, there came a push for westward expansion. Americans were coming into the Kaskaskia area in large numbers. What would Nicholas do for himself and his family? Would he move again? Reda says he likely would go to Spanish Louisiana, across the river, but doesn't give any reason why (the only thing I could come up with is "because we found him in records there", but maybe an actual, legitimate reason was cut in editing). He then produces a census of the Spanish territory which enumerated immigrants coming from the United States during December 1, 1787–December 1789. Nicholas ("Nicolas") Janis is indeed on the list; his household consisted of nineteen people, fifteen of whom were slaves. Etheridge appears very deflated at learning this and finds it disturbing. Reda admits it is part of our past, attempts to gloss over it by saying it was the way of the world in the 18th century, and ends by conceding it is still troubling. He then focuses on the fact that Nicholas had moved a good-sized household to a different country, across the river, but in reality only a few miles. 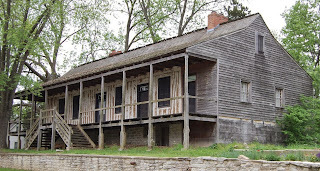 Nicholas moved to Sainte Geneviève, the oldest European settlement in the Mississippi Valley on the west side of the river. Etheridge realizes that Nicholas was living under his fourth national government — starting in Québec and moving to the Illinois Country as a Frenchman, then British rule after the French and Indian War, for a short time in the United States after the American Revolution, and then to Spanish territory. Always wanting more, Etheridge asks Reda how she can find what happened after that. He tells her she should go to Sainte Genevieve, where she should be able to find records for Nicholas for the late 1780's. Leaving Kaskaskia, Etheridge is still disturbed over the revelation that her ancestor owned slaves. She had never felt that slavery was part of her father's side of the family, and it has really thrown her. Learning it was part of her family's past just four or five (actually seven) generations ago is eye-opening for her. As Etheridge drives to the Sainte Genevieve County courthouse, about 15 miles from Kaskaskia, she says she has asked local historian Robert J. Mueller to help her find out what happened in Nicholas' final days. (How does she know she's going to learn about his final days? I thought they didn't tell the celebrities ahead of time what was coming up. Hmmm . . . .) Mueller says he has a couple of documents to share with her. He has her put on conservator gloves to handle the 220-year-old paper. On the document we see, Etheridge recognizes Nicholas' signature at the bottom. A second signature is from François Janis. The document is a deed dated April 20, 1796, by which Nicholas Sr. was giving his property to his son François. Etheridge surmises that François was named for his grandfather, and Mueller agrees. After nine years in Spanish Louisiana, Nicholas was giving his son a house, barn, stable, garden, and orchard. Nicholas was then about 76 years old. Mueller says that François was going to take care of Nicholas as he got older, but we weren't shown anything in the document about that. We don't see any other document (so much for "a couple" and poor continuity editing), but Mueller says he has one more surprise for Etheridge: The house that Nicholas deeded to François is still there. It is the oldest in Sainte Genevieve, and some people believe it to be the oldest house in Missouri. Mueller adds that he can arrange with the owner of the house (possibly Hilliard and Bonnie Goldman?) for Etheridge to see it. She is obviously thrilled. Leaving the courthouse, Etheridge seems somewhat in awe that four generations of her family helped build this part of America. She feels as though she belongs, especially since her father was born a hundred miles from where she is. She had believed that her father's family was always poor, but now she knows they were wealthy in the past, not just monetarily but with history. The house is a big, old, wood building with a porch running the length of the front. Etheridge walks around and through it, musing about her ancestors. She used to joke about her heritage being just poor white people forever, but she can't do that now. Nicholas had so much prosperity, but four generations later (really six) her father was in complete poverty, so wealth just comes and goes. Now she is successful, so maybe that will last for a while. She thinks again about how François stood up for Charlotte, because the father-daughter relationship is so important to her (even though she says the mother defended Charlotte also, of which there was no evidence), and she's looking forward to sharing all of this with her own children. Two things I noticed we didn't find out were when Nicholas died and what happened to his slaves. It's easy to guess that he probably died soon after he deeded his property to his son François, because it often happened that way; when people knew they were very ill and might die soon, they suddenly made out wills and took care of that type of thing. But since nothing else was said about the slaves, I suspect they were not freed for some time, perhaps not until 1865 and the end of the Civil War. This was another episode where I found a transcript online, so if you want to read pretty close to the verbatim conversations, you can. 1) Determine where your ancestral families were on 16 May 1865 - 150 years ago. 2) List your ancestors, their family members, their birth and death years, and their residence location (as close as possible). Do you have a photograph of their residence from about that time, and does the residence still exist? I discovered I don't have any specific information for where people were living just after the American Civil War officially ended. I've found most of the U.S. ancestors in the decennial censuses but not the in-between years. For my Jewish ancestors, who were all still in Eastern Europe, I have no real information on locations but can make educated guesses. 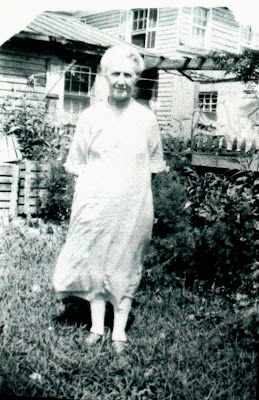 Rachel (Godshalk) Sellers (1809–1894), my 3rd great-grandmother, was probably living in Belvidere, Warren County, New Jersey (where she was in 1860) or in Philadelphia, Pennsylvania (where she lived in 1870). John Fox (1786–1880) and Catherine (Fisher) Fox (1789–1877), my 4th great-grandparents, were living in Philadelphia, Pennsylvania. I don't know exactly where. William Owen (~1809–1878) and Sarah Fox (1816–1878), my 3rd-great-grandparents, were living in Philadelphia, Pennsylvania with their daughter, Catherine Fox Owen (1849–1923), my 2nd-great-grandmother. I don't know exactly where. Catherine (Stackhouse) Armstrong (born 1796–1800), my 4th great-grandmother, may or may not have been alive. I have narrowed down her death to 1860–1870. If she was alive, she was living somewhere in Burlington County, New Jersey. Franklin Armstrong (1825–after 1870), my 3rd-great-grandfather, was living in Mansfield Township, Burlington County, New Jersey with his son, Joel Armstrong (1849–~1921), my 2nd-great-grandfather. Abel Amos Lippincott (1825–after 1885) and Rachel (Stackhouse) Lippincott (~1825–after 1885), my 3rd-great-grandparents, were living in Burlington County, New Jersey. I don't know exactly where. Sarah Deacon Lippincott (1860–after 1904), my 2nd-great-grandmother, was almost definitely living somewhere in Burlington County, New Jersey. In the 1860 census she was not yet born and in the 1870 census she was not with her parents, however. James Gauntt (1831–1889) and Amelia (Gibson) Gauntt (1831–1908), my 2nd-great-grandparents, were almost definitely living in Burlington County, New Jersey. I don't know exactly where. Frederick Cleworth Dunstan (1840–1873) and Martha (Winn) Dunstan (1837–1884), my 2nd-great-grandparents, were living in one of the suburbs of Manchester, Lancashire, England. I don't know exactly where. Zvi (died before 1903) and Esther Mekler, my 3rd-great-grandparents, were probably living in Kamenets Litovsk, Russia (now Kameniec, Belarus), with their son Simcha Dovid Mekler (died before 1903), my 2nd-great-grandfather. Bela (died before 1924) (I don't know her maiden name), my 2nd-great-grandmother, who would later marry Simcha Mekler, was probably somewhere in the area of Kamenets Litovsk, but that's just a guess. She would have been young, maybe between 5–10 years old, and probably living with her parents, but I don't know their names. Abraham Yaakov (died before 1896) and Sirke (died before 1893) Nowicki, my 3rd-great-grandparents, were probably living in Porozowo, Russia (now Porozovo, Belarus) with their son Gershon Itzhak Nowicki (~1858–1948), my 2nd-great-grandfather. Ruven Yelsky (~1838–~1898) and Frieda (Bloom) Yelsky (~1838–~1898), my 3rd-great-grandparents, were probably living in Porozowo, Russia with their daughter Dora Yelsky (~1858–1936), my 2nd-great-grandmother. Gersh Wolf Gorodetsky and Etta (Cohen) Gorodetsky (died before 1891), my 3rd-great-grandparents, were almost definitely living in Podolia gubernia, Russia, probably near Kamenets Podolsky (now Kamyanets Podilskyy, Ukraine). Their son Isaac/Avigdor Gorodetsky (died 1925), my 2nd-great-grandfather, may have been with them; I have approximated his birth year to 1864–1868. Joine (died before 1893) and Chane Etta (died before 1891) Schneiderman, my 3rd-great-grandparents, also were likely living in Podolia gubernia, Russia, probably in the area of Kamenets Podolsky. Solomon (died before 1909) and Yetta Brainin, my 3rd-great-grandparents, were probably living near Kreuzburg, Russia (now Krustpils, Latvia) with their son Mendel Hertz Brainin (~1862–1930), my 2nd-great-grandfather. I don't have photographs of any of the residences and don't know if any of them still exist. (I hardly have any photos of the ancestors in this list! I think I have photos of eight of them.) I suspect none of the homes in Eastern Europe are still there, though. None of my great-grandparents had been born yet. This was an interesting exercise. It really pointed out to me how many birth and death years I am lacking for my mother's ancestors. It wasn't very difficult for me to choose my favorite, because I'm a sucker for multigeneration photographs. The photo is not dated. I don't know what the occasion was for the photograph, and the three people in the photo have all passed away, so I'll probably never learn. I can make an educated guess that it was taken in Miami, because that's where my grandparents lived, and my great-grandmother moved there after my great-grandfather died, which was May 2, 1955. 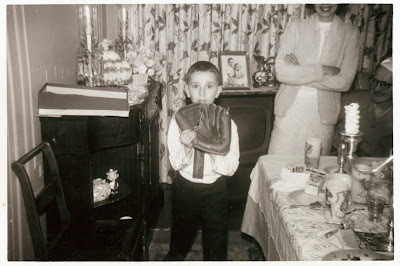 I suspect my grandfather took the photo; he took most of the photos in the family. My mother, Myra Roslyn Meckler, is on the left. To me she looks to be about 20 years old, which would mean it was taken around 1960, the year before she married my father. 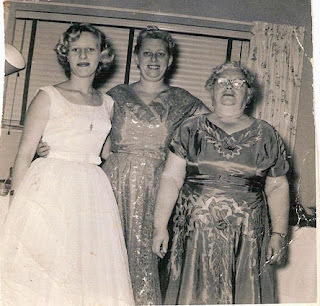 In the middle is my grandmother, Lillyan (Gordon) Meckler, and on the right is my great-grandmother, Sarah (Brainin) Gordon. This is a great photo for Mother's Day, because I can honor three generations of mothers on that side of my family. I was so excited when I finally received an American Community Survey (ACS) in the mail from the U.S. Census Bureau. I was, after all, one of the vast majority who received only the (very) short form during the 2010 census, which asked for minimal information. Being a genealogist, I was disappointed that I would not be leaving a detailed census form such as the ones I rely on for so much of my research. Here was my opportunity to have more detailed information about myself be recorded for posterity. My excitement over the ACS quickly turned to frustration. At the very beginning of the survey, I had to settle for giving the Census Bureau inaccurate information. Considering how many historical censuses have wrong information (albeit a lot of it likely due to simple communication problems between census takers and residents, as opposed to deliberate obfuscation), that really annoyed me. How much of a difference does that make, you ask? Well, according to the cover letter I received with my instructions for the ACS, "[t]his survey collects up-to-date information used to meet the needs of communities across the United States. For example, results from this survey are used to decide where new schools, hospitals, and fire stations are needed. This information also helps communities plan for . . . emergency situations . . . such as floods and other natural disasters." In the 2010 census, Emeryville was enumerated as having about 10,000 residents. Oakland, on the other hand, has a little more than 400,000 (and we're still smaller than Fresno, something which pains me deeply :( ). If I estimate that as low as 2.5% of Oaklanders live in the 94608 ZIP code area, that equals 10,000 people. Counting them as Emeryville inhabitants effectively doubles the population of the small city, and removes that number of people from the Oakland population total. Do you think that could skew emergency planning? Thinking of future genealogists, assuming the ACS information ever becomes public, researchers would probably assume that I lived in Emeryville because, after all, that's what the government information would say. Those researchers would quickly become as frustrated as I am now when they didn't find any information about me in Emeryville and in fact couldn't even find my street address there. There's enough inaccurate information out there already. Does the government have to deliberately create more by unwarranted shortcuts? Slowly but surely working my way through the last two episodes of this season of Who Do You Think You Are? Only one more after this! It's rewatching to catch details that gets me every time. The opening voice-over for the Bill Paxton episode says that he would uncover a war hero — we hear Paxton saying the word "spy" — bloody battles, and the shocking truth about an ancestor. We then hear that he is a celebrated actor and director with an outstanding career spanning four decades, and that he has starred in some of the most celebrated films of all time. The only films they mention, however, are Apollo 13 and Titanic. (I haven't seen Apollo 13, but I have seen Titanic, and let's face it, it was not well known for the quality of its acting or script.) He also appeared in HBO's Big Love and a mini series, The Hatfields and the McCoys, for which he earned an Emmy nomination. I was surprised they didn't mention The Terminator, Aliens, or Predator 2, probably much better known movies, but the film I always think of first for Paxton is the vampire cult classic Near Dark, a favorite of a former housemate of mine. Paxon and his wife, Louise, live in Southern California with their children, James and Lydia. We see Lydia in passing for a very short scene, and that's it for family member appearances. Paxton says he was born in Fort Worth, Texas, and that his parents are Mary Lou Gray and John Paxton (who was in three movies with his son). Paxton had a close relationship with his father, who died three years before the episode was filmed. They shared many of the same interests: theater, books, movies, and history. Paxton credits his success to his father. Because he was so close to his father, Paxton already knows quite a bit about that side of the family. He had a great-great-grandfather who was a Confederate general and a great-grandfather who was an attorney in Independence, Missouri. He's hoping to learn more about that side and maybe to gather strength from what he finds. He also hopes he discovers some "savory bits" (ah, don't we all). For the third time in seven episodes, the celebrity begins by meeting a researcher at the downtown (main) branch of the Los Angeles Public Library. (Maybe the show sent out a casting call in the L.A. area?) Paxton connects with Ancestry.com employee Kyle Betit, who earlier this season worked with Josh Groban. Paxton has told Betit he wants to learn more about the roles his family played in history. Betit has done some initial research and hands Paxton one of the famous "here's your family, already done" tree rolls. He insists that Paxton be the one to unroll it, though. He also says that he found the tree to be pretty impressive, but he's an Ancestry employee, so it's hard to tell if that's his real opinion. The tree goes back to at least one 5th-great-grandfather, but he's on the Paxton line, and we have no way of knowing how much of the information in the tree was already known to Paxton from his family's prior research. Paxton starts reading the names in the Paxton line, starting with himself. His father, John, was born July 14, 1920 in Missouri and died November 17, 2011 in California. Paxton comments that "he passed, it'll be three years next month", so we know this was shot in October 2014. Next is grandfather Frank Paxton, born June 10, 1887 in Missouri, died May 16, 1951 in Missouri. Great-grandfather John Gallatin Paxton was born September 17, 1859 in Virginia and died September 24, 1928 in Missouri. He was the attorney in Independence. Second-great-grandfather Elisha Franklin Paxton, the Confederate general, was born 1828 in Virginia and died March 4, 1863 in Virginia (at the Battle of Chancellorsville). Third-great-grandfather Elisha Paxton was born about 1784 in Virginia and died November 24, 1867 in Virginia. Fourth-great-grandfather William Paxton was born about 1733 and died in 1795 in Virginia. 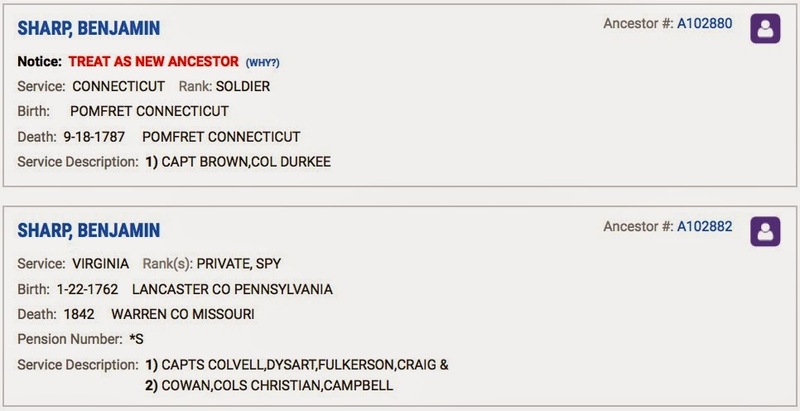 The last name is John Paxton, Bill Paxton's fifth-great-grandfather, who was born about 1692 and died about 1746 in Pennsylvania. No women's names are shown as we travel up the Paxton line. After revisiting the names of his ancestors, Paxton says that he knows he has a family connection to the Civil War but wants to find someone in the American Revolution. Three of his fourth-great-grandfathers were alive and of appropriate ages during 1775–1783, the years of the war: William Paxton; Frank Wyatt, born 1757, died 1824 in Kentucky; and Benjamin Sharp (who married Hannah Fulkerson, born 1769, died unknown), born 1762 in Pennsylvania, died unknown. The question is, did any of them serve? When they show these names on the family tree floating in the sky, we finally see more women's names. John Gallatin Paxton married Mary Neil Gentry, whose mother was Mary Neil Wyatt. Her father was John Wyatt; his father was Francis Wyatt (as opposed to Frank, as he is shown in the family tree scroll). John Wyatt was married to Attossa Pinkney Sharp, whose father was Benjamin Sharp. In one of those rare occurrences on WDYTYA, the first computer site we visit is not Ancestry.com. Betit suggests Paxton use the Ancestor Search on the Daughters of the American Revolution site. Paxton appears to be familiar with the name of the organization and knows it is in Washington, D.C. He uses his spiffy iPad to look first for William Paxton and then Frank Wyatt, both of whom give results of "No ancestor records found." (This doesn't necessarily mean those men didn't serve in the Revolutionary War. It could simply mean that no one has applied for membership in DAR and proven service by either man. In fact, the Wikipedia page for Elisha Franklin Paxton says that William Paxton was an American Revolutionary War veteran but gives no further information.) When he enters Benjamin Sharp's name, however, he is successful and says service Virginia, rank private, and spy — and then we cut away to a commercial. When we return, the narrator says Paxton has "just discovered a record" about an ancestor, which is absolutely not correct. What Paxton found was an index entry with transcribed notes, nothing more. And when you find transcribed information, you should always look for the original document. What they don't mention on the program is that a search for Benjamin Sharp actually gives two results. The second one is Paxton's ancestor. 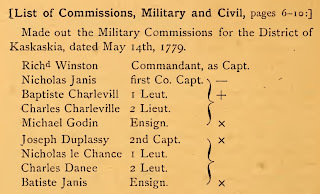 The first one includes a notice to treat as a new ancestor, which means he was used by someone in the past for membership in DAR, but since then there's some question about his service, and anyone wishing to claim him as her Revolutionary War ancestor must reprove his service before membership can be approved. That said, now that he has found the entry, Paxton of course wants to track down more information. He notes that Sharp died in 1842 in Warren County, Missouri, where John Paxton was from, and asks Betit where he should go next. The surprise is that Betit tells him he needs to go, not to Missouri, but to the DAR library, where the people there should be able to help him find some more documents about Sharp's life and service. Yes, the average person would probably just write to DAR, but on TLC and Ancestry's budgets, it's easy to fly across the country. In the interlude, Paxton says that he knew his father's side goes back to the late 17th century in this country and that he had family alive during the American Revolution, but didn't know anything about Sharp. Now he's wondering for whom Sharp was a spy. As he drives around Washington, Paxton says he loves D.C. His first trip there was in 1968 with his father and he has good memories. As he arrives at the DAR library, he comments that it has one of the largest collections of genealogical documents relating to Revolutionary War patriots. He is going to meet historian Jake Ruddiman (of Wake Forest University in North Carolina), whom he has asked to find information on Benjamin Sharp. Ruddiman wastes no time in laying a folder on the table in front of Paxton. In it is what appears to be a letter (but we are told is a deposition) written by Benjamin Sharp. Dated May 7, 1833 in Montgomery County, Missouri, Sharp was making an official record of his military service during the war. He was about 71 years old at the time and a resident of Warren County. Paxton reads excerpts from the document, which is shown in short shots on screen. In June or July of 1776 Sharp was living in Washington County, Virginia. He volunteered with Captain Andrew Colville at Black's Fort (now Abingdon, Virginia). He was about 14 years old. Ruddiman interjects that Sharp was serving with a Virginia militia group, which would have consisted of family members and neighbors. Militia were local men tied to their town or county, who defended their homes and land when the war came to them. This was in contrast to the Continental Army, which was composed of men serving with George Washington who went to the British to fight against them. At times, militia might fight with the Continental Army, if the army came to their area. Paxton continues to read the deposition. Sharp said he was a spy, and the deposition said "ranging." He was at Glade Hollows Fort. Ruddiman explains he was probably a scout and tracked enemy movements on the roads and trails. It was an important role, because if the British surprised the local people, they could die. Ruddiman adds that Sharp's position was important but dangerous, and that Sharp was expendable because he was young, unmarried, and had no children and no farm. It would be tragic for his family, but if he died, it would not have been very disruptive to the community. In 1778 or 1779, Sharp wrote, his detachment took several Tories. This prompts a discussion about how the men knew who was a Tory. Ruddiman admits that it was by roughing people up, often at sword point. Sharp wrote that in 1780, Colonel (Charles) McDowell of North Carolina was driven by British and Tories over the mountains. Sharp volunteered in early September and marched with other men to the Carolinas. They overtook the British and Tories in South Carolina at Kings Mountain. The narrator says that Patriot militiamen began in Virginia (the map shows them leaving from Abingdon, which was still Black's Fort at the time) and marched more than 200 miles over two weeks, on foot and horseback, to Kings Mountain in South Carolina. The men, including Sharp, walked the last 24 hours in rain, arriving in October 1780. Ruddiman explains that Kings Mountain was a pivotal battle of the Revolution in the South. Even though he just read it in the deposition, Paxton asks where Kings Mountain is and is told South Carolina. Ruddiman adds that the battle site has been preserved as a national military park and that Paxton needs to go there. As he leaves, Paxton says he wishes his father were there because he would have enjoyed hearing about the history connected with the family. He is astounded at the first-hand account he's just read and really feels his ancestor talking to him across time. He hopes to find details about the battle and learn how it started and ended and how many casualties there were (all the gory details). 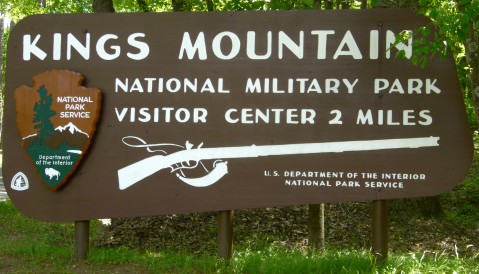 Now he is off to Blacksburg, South Carolina, the location of Kings Mountain National Military Park. As Paxton drives to Kings Mountain, he sees a welcome sign (not the one shown on the program) and apparently reads, "Enjoy your visit," which he follows with, "I will. I had a relative who was here!" At the park he is looking at one of the informational signs when Chris Revels, the Chief Park Ranger, walks up and asks if he can show Paxton the battlefield. Revels tells Paxton that at the time of the battle here the war had been going on for a few years, and this battle came at a brutal point. The narrator returns, telling us that after having suffered several defeats in the north, the British had moved their efforts to the south, where they recruited Loyalists to fight with them. They then won significant victories and played havoc with the Continental Army. British Major Patrick Ferguson, leading a group of Southern Loyalists, threatened to attack frontier Patriots. Southern Patriots planned their own attack. The militiamen, including Sharp, confronted Ferguson and his men at Kings Mountain in a battle that changed the course of the war. Revels calls the battle the first civil war in this country, with American versus American, about 1,000 men on each side. He confirms that Sharp marched about 220 miles to get here from Virginia. He points out that he and Paxton are standing on a ridge crest to the left of where Colonel (William) Campbell and Benjamin Sharp would have come up the ridge. Paxton, of course, decides that means they are standing on the exact spot the men came up the ridge. The Patriots (Revels says Americans, but since he's already told us that both sides were Americans, that doesn't help to identify which side he means, does it?) made three charges uphill, so it must have been a bloody battle. Then Revels says he has a first-hand account of the battle, if Paxton is interested in reading it. Coincidentally, it's by Sharp. Sharp's account (click the "next result" link at the top) was first published in American Pioneer in February 1843; it was written when he was about 80 years old. He mentioned the low gap the men had come through, which is now the road up which Revels and Paxton walked to reach the crest. Sharp talked about how the Patriots surrounded the British and Loyalists, and Sharp's militia led the charge. Major Ferguson, when he realized his side would lose, essentially committed suicide by breaking his sword and charging into the midst of the Patriots. Shortly after that the British surrendered. The battle lasted about an hour. After the battle it was near sundown, and the men camped on the battlefield, among the dead and dying. Sharp's signature is at the end of the article. Revels says that about 28 men died on the Patriot side and 225 on the British. Thomas Jefferson called the battle the turning point of success in the American Revolution. Paxton wants to know what happened to Sharp after the battle. He was only 18 years old at the time, and he had a lot of life left. Revels says that Paxton can probably find some answers at the Library of Virginia, the home of the Virginia State Archives, and tells him that the archives are in Richmond. As the two men walk off in different directions, I noticed that Revels has the book in his hands. What, they couldn't afford a copy to give to Paxton? It was somewhere around here that I got tired of hearing Paxton say "amazing." I counted: nine times in the episode. He needs to find a new word. In this interlude, Paxton admits he's very emotional about what he has learned. He's proud of his ancestor and knows his father would have been also. He thinks about Sharp's experiences at the age of 18 and can't conceive of his own son, who is 20, doing similar things. Learning about his ancestor's experiences is really bringing the American Revolution alive for him (which is a great thing!). Now he wants to know what Sharp did with the rest of his life. Maybe Paxton understands how the celebrities on this show are led around, because he says, "So you guessed it — I'm off to Richmond, Virginia," to introduce the next segment. The more he learns about Sharp, the more he wants to learn. He's convinced that Sharp's life continued to be remarkable. At the Library of Virginia, Paxton meets Gregg Kimball, one of the library's historians. Kimball says that he found Sharp in southwestern Virginia and has a document from the executive papers of James Monroe (the one who became president) when he was Virginia's governor. Paxton finds Sharp's name among the 60 or so on the document, which is a list of commissioners appointed to oversee the 1800 presidential election. The candidates in the election were Thomas Jefferson and John Adams. Sharp was then about 38 years old (I guess they didn't have any interesting documents to show for the 20 years in between) and had a prestigious position. He was working on the state level in politics, and Monroe would probably have known who he was. The next item Kimball brings out is an 1804–1805 attendance book for the Virginia General Assembly. He directs Paxton to look in Lee County, where Benjamin Sharp, Esq. is listed. He had moved up a little more in status and was then a member of the House of Delegates, the lower house in the Virginia state legislature. Kimball points out that Sharp probably was an independent landowner and a man of some means; all assembly members were substantial landowners. Paxton wants to know if the library has records of Sharp's personal property or land transactions (wanting to know just how much he owned?). Kimball says indeed they do, and the two move to a microfilm reader. First Kimball has Paxton scroll to the year 1804, the year Sharp was in the assembly. He then has Paxton note what the row labels are so that he'll be able to interpret the numbers later. The categories Paxton writes down are number of white males over 16, number of blacks over 12, number of blacks over 16, and number of horses/mares/mules. Paxton understands that blacks would refer to slaves but not why there's a differentiation between age 12 and 16; Kimball explains that they were taxed at different rates, children versus adults. Kimball does not have Paxton write down the categories of retail store license, ordinary license, stud horses, and rates of covering per season, so I figured Sharp wasn't going to have been taxed on any of those. But he did have him write down the two slave categories, so I knew what I was expecting to see. And indeed, when Paxton finds Sharp's entry on the tax list, it includes 2 white males over 16, 1 black over 12, 4 blacks over 16, and 9 horses/mares/mules, though the animals are never discussed. When Kimball confirms that the five blacks listed were slaves, Paxton says, "Unbelievable." Kimball adds that Sharp could have owned more slaves — women and children younger than 12 — who wouldn't appear on the list because they weren't taxed. Paxton: "Well, that's unfortunate." From a modern perspective, this is horrible, and now this man whom he has considered to be so great doesn't seem quite as nice. But he then adds, "Good and bad, it's your history." At least he's honest about it and didn't ask the producers to take that part out, à la Ben Affleck. Whether they talked more and it was edited out we don't know, but that was the extent of the slavery discussion in the segment. Paxton wonders where he should go from there and recalls that Sharp died at the age of 71 (from the information we have at this point, he was actually about 80) in Warren County, Missouri. Then was another one of those comments that makes me think he gets the joke: "So something tells me I'm going to Missouri now." Kimball concurs, and Paxton leaves. This interlude is a little more somber. 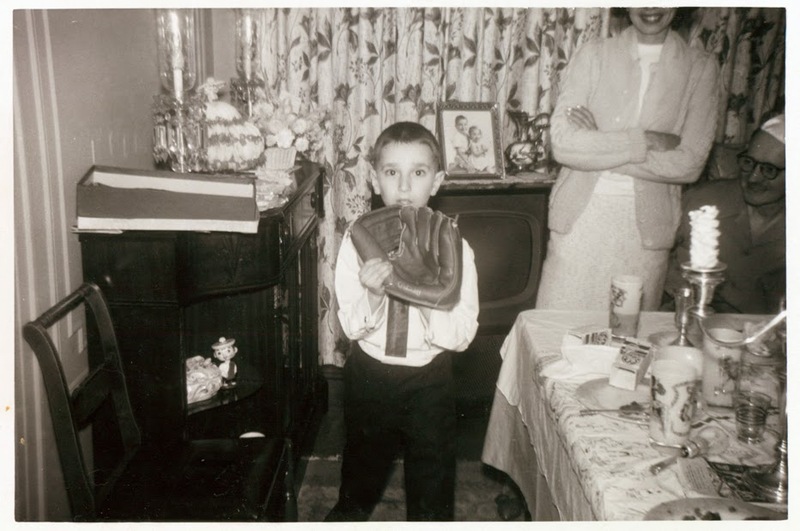 Paxton recalls how his father told him that all idols have feet of clay; everyone has foibles. Learning that Sharp owned slaves seems to have thrown him off, and he admits he hasn't had a chance to process the information yet. But in Missouri he figures he'll find out the rest of the story. Paxton is happy to be in Missouri, the land of his father, and his father, and his father before him. He's heading to the town where Sharp spent the last part of his life. He's going to meet historian Gary Kremer, who has already let Paxton know that he found a significant document about Sharp. Kremer greets Paxton at the Warren County Historical Society. Kremer starts out by saying that some of the great social history documents available to researchers are probate records. He then brings out Sharp's original will, dated June 19, 1845, not long before Sharp died (which means that the death date in the DAR database is off!). Paxton compliments the beautiful handwriting (which looked really similar to the writing in the 1833 affidavit we saw near the beginning of the episode, but it didn't generate any comments then) before beginning to read. Sharp wanted to have his estate divided equally among his children. He also wrote, "My faithful servants, Bill and Judy, shall not be separated, but shall be left in the possession of all the livestock that may belong to them." Servants in this instance is a euphemism for slaves. Now we get some heavy-duty rationalization of Sharp's mores. Kremer admits that Sharp still believed in the institution of slavery but emphasizes that he obviously cared about Bill and Judy, because he wanted them to be taken care of. He wanted them to have land; he included a clause in the will stating that they were not to be sold against their will to strangers but should stay with Sharp's children. He asked his descendants who inherited his slaves to treat them with humanity. But guess what? He didn't say anything (or at least we sure didn't hear anything in the episode) about actually freeing them. So personally, I'm not buying the rationalization. I don't think Paxton did, either; his comment was, "[T]hat's a tough one there." Major understatement, Mr. Paxton. To his credit, though, he again does not apologize for his ancestor. He finds it disturbing to learn that his ancestor owned other human beings. He does not understand how they could have been so blind. This segues into a broader discussion, led by Kremer, of how even "enlightened" men of the period — Jefferson, Washington — owned slaves and the conclusion that slavery would end up tearing the country apart. Kremer has no more documents on Sharp, but he "suggests" to Paxton that maybe they should try to trace Bill and Judy. He says they can look at the 1850 census and "perhaps" find them and learn what their status is. Paxton quite reasonably says they don't know Bill and Judy's last names. Unfortunately, Kremer adds, "It's very likely — not a certainty . . . that they might have taken the Sharp name?" Well, no, Mr. Kremer, it isn't that likely in most circumstances. Shame on you for continuing to spread this misinformation, when modern scholarship has indicated that the majority of former slaves did not take their former owners' names. But TLC and Ancestry have to pretend that these records are just being discovered, when in fact the researchers behind the scenes found them months ago. And that means you have to give Paxton a reason to search on the names you already know they're listed under. Feh. The only positive thing to say about this part is that the ubiquitous Ancestry.com search (I am convinced that a celebrity will not be approved if there's no document on the site) did not appear until 48 minutes into the hour. Kremer has Paxton search for William Sharp (why not Bill? oh, because that's not how he's listed) in Warren County. There are two results, both born in Virginia, one about 1780 and the other about 1811. Though either man is plausible, Kremer has Paxton choose the one born in 1780, saying that would be about the right age. We haven't heard anything prior to this about how old Bill was, however, or exactly when Sharp came to Missouri. Surprise, surprise, we see Bill and Judy, now William and Judith, listed in the census of free inhabitants; Bill is a farmer. We know they're the right people because they are mulattoes (the only people on the page who are not white, in fact). The fact that both of them were born in Virginia means they came as slaves with Sharp when he moved from Virginia to Missouri. Kremer points out to Paxton the significance of Bill and Judy being enumerated on the census of free individuals. Kremer says that Sharp's sons were fulfilling his mandate by providing protection and watching over Bill and Judy, but this is beyond Sharp's instructions. Not long after after Benjamin Sharp passed away, someone, most likely one of his descendants, took the extra, humane, step and actually freed Bill and Judy. Kudos to him. But couldn't the research team find the manumission document? I guess it wasn't Paxton's ancestor who did it, because then they surely would have shown it. Paxton asks what else there is and accuses Kremer of holding out on him. Kremer admits that Sharp is buried about 20 miles from where they are at the moment. The grave is on private property, but the owner has given permission for Paxton to visit the gravesite. Naturally, he wants to see the grave, so that's where he'll head next. Now Paxton does some rationalizing. He says how amazing it was to hold his ancestor's original last will and testament and adds that Sharp was a very fair man who was concerned about the people in his life. That's a big stretch. Seriously, if he were that concerned and that fair, he would have freed Bill and Judy himself. Paxton is looking forward to visiting Sharp's grave and standing on land that Sharp once owned. We see Paxton driving on an unidentified highway, with no signs to indicate where he's headed. I'm sure if you're from the area you could probably recognize some landmarks, but for the rest of us, the location of Benjamin Sharp's grave will never be known. I guess they couldn't commandeer the highway they do repositories; at one point a car passed by him going in the other direction. Next we see Paxton driving down some sort of side road. Then he is suddenly walking through trees trying to find the gravestones. He even comments, "Wow, it really is in the woods." Obviously, the cameramen know where the graves are (did they have to cut a path for the equipment? ), but either Paxton wanted to try to find them himself or they were told to let him do so, because he wanders around a little before getting there. Unlike the new, replaced stones that Tony Goldwyn found, these stones really look to be more than 150 years old. The text on them is barely readable. Paxton traces his fingers over the letters: Benjamin Sharp, died January 1, 1846, and Hannah, whose stone is next to Sharp's. Paxton has brought some stones from Kings Mountain and places them on Sharp's tombstone, saying, "You are not forgotten." I found that very touching. In the outro, Paxton talks about how the journey he has taken during the past week has given him a lot of food for thought, and he becomes philosophical. Seeing the Sharps' gravestones has brought everything home to him in a different way. He will make sure his children know the stories of how their ancestors blazed a trail before them and learn that history. He says his father taught him that prejudice is based on fear and ignorance, a lesson he also wants his children to know, and he wants them to know more about their family history. People tend to want to hide the less pleasant parts of their history, but it's important to look at those parts also to understand who you are. It isn't what your ancestors did that defines you, however, but what you do yourself. Are you going to leave the world a better place than how you found it? One final note: Sometimes I find transcripts of television shows online, often generated by closed captioning systems. A transcript of this episode is here, complete with hmms and ahs.